An endangered olive ridley sea turtle rescued last October was returned to her ocean home for a second chance at life on after rehabilitation at SeaWorld San Diego, California. ‘Coral’ was estimated to be between 18 and 25 years old when she was found stranded on an Oregon beach on 20 October 2017. Emaciated, weak and hypothermic, she was taken to the Seattle Aquarium, Washington state’s only sea turtle rehabilitation facility, in critical condition. The aquarium’s zoological staff immediately began lifesaving medical treatment, including addressing serious bacterial infections. After three months of care in Seattle, Coral’s condition had stabilised and she was ready for her next phase of rehabilitation. On 28 January 2018, Coral was flown to San Diego on a U.S. Coast Guard flight and brought to SeaWorld for continued care, the only facility on the West Coast of the USA capable of providing long-term rehabilitative care for sea turtles. Turtle experts at the marine park provided additional life-saving care, including antimicrobial and antifungal therapy, which Coral responded to well. 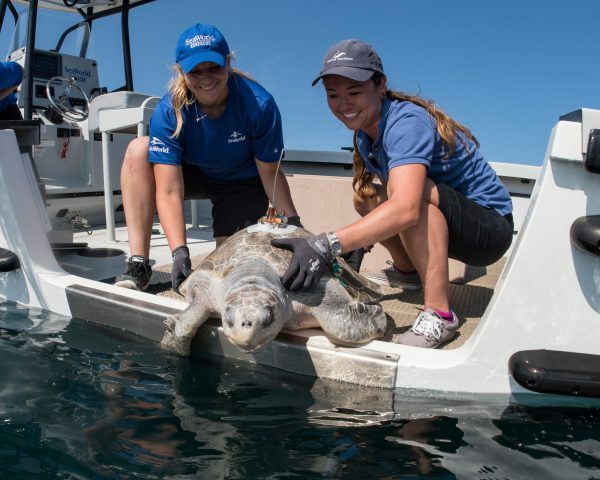 Once the ocean temperature off the Southern California coast became stable at around 21 degrees in early August 2018, Coral was returned to her ocean home approximately 10 miles off the coast of San Diego. Olive ridley sea turtles can live for up to 50 years, so experts hope Coral has many more years to enjoy in the wild. A satellite tracking device was attached to Coral by Hubbs-SeaWorld Research Institute so that researchers can follow her movements at sea. The tracking device will provide important information on her daily locations and ocean water temperature. Researchers hope they’ll be able to monitor Coral’s movements for several months. Olive ridley turtles are protected under the U.S. Endangered Species Act. They are found throughout the Pacific Ocean, although they are mostly found in tropical and subtropical areas. While olive ridley turtles generally don’t venture any farther north than Southern California on the eastern Pacific coast, they occasionally swim further north into colder waters off Oregon and Washington. Coral’s rescue and rehabilitation was conducted in coordination with U.S. Fish & Wildlife Service.